The last full week of Lent Madness begins right now. But do not despair as there are many miles to walk and votes to cast before we sleep and/or award the coveted Golden Halo. Tomorrow we begin the Elate Eight aka the Round of Saintly Kitsch. Will the Kitsch Kranks come out in full force? Will it be Kontroversial? Stay tuned as the Saintly Smackdown continues at its usual Krazy pace! “Bonhoeffer spent time in 1920 and 1931 at Union Theological Seminary in New York City. He was chilled by the bourgeois white churchliness of conservative America. But, in the local communities of the “other America,” he found evidence of the church he was searching for. The storefront churches and self-help centers of Harlem and the ecumenical and cosmopolitan atmosphere of the seminary impressed Bonhoeffer.” From Who is Christ for Us? The Acts of Barnabas (likely written in the 5th century) again shows us how Barnabas was remembered. The short work recounts some biblical stories with greater detail and then describes the journeys of Barnabas and John Mark after their parting with Paul. The dispute with Paul is far more cordial than described in Acts with Barnabas calmly arguing, “The grace of God will not desert one who has served the Gospel.” The text includes a beautiful reflection on what it means to be clothed in Christ at baptism – “There is in it nothing filthy, but it is altogether splendid.” The Acts also depict his martyrdom by burning and how he was buried with his copy of the Gospel of Matthew (a Gospel that is, like many of the writings that bear Barnabas’ name, rooted and grounded in the Jewish scriptures). The final text that bears Barnabas’ name is a late text, likely post-Medieval. The Gospel of Barnabas, which only survives in Italian and Spanish translations, perhaps offers the most important message for us today in the West. At a time when Muslims are routinely denigrated and anti-Muslim rhetoric is on the rise, perhaps we would do well to remember Barnabas’ commitment to seeing the best in people, be they Paul the Apostle or his friend (cousin?) John Mark. In this Gospel, Barnabas presents a Jesus who is sympathetic to Muslim belief and practice. Barnabas’ example as a bridge-builder between people and communities is very much needed today. 130 Comments to "Dietrich Bonhoeffer vs. Barnabas"
There is no figure who means more to me this Lent than Dietrich Bonhoeffer. And there is no “thinner place” in the twentieth century than where God met man at the gallows in Flossenburg prison. Bonhoeffer was hanged naked with a wire as the Third Reich collapsed. Bonhoeffer’s halo is not a golden circlet but a crown of thorns. Bonhoeffer asked: how do we dare say the Psalms with their imprecations and curses? By praying together. It is Jesus praying for us, and together in our prayers we enact the Incarnation. By singing hymns together, we manifest God. I found an Easter card with a picture of Jesus saying “Save me some chocolate eggs. I’ll be back in three days.” And I laughed, because suddenly the Resurrection was real to me: human, palpable, and funny. We together on this Lent Madness journey inhabit a “thin place.” Whom would we most want to see in the flesh? If I could with my vote bring one person back, to joke and break bread with, it would be Dietrich Bonhoeffer. I cast my vote today as a chocolate egg for Dietrich. I loved your reflection and agree with what you had to say. Very emotional and true. Dietrich Bonhöffer’s insights are increasingly needed today in a world that is becoming increasingly divided by an “us” versus “them” mentality. I am reminded of Martin Niemöller’s quote often attributed to Bonhöffer: “In Germany they came first for the Communists, and I didn’t speak up because I wasn’t a Communist. Then they came for the Jews, and I didn’t speak up because I wasn’t a Jew. Then they came for the trade unionists, and I didn’t speak up because I wasn’t a trade unionist. Then they came for the Catholics, and I didn’t speak up because I was a Protestant. Then they came for me, and by that time no one was left to speak up.” It certainly applies to Bonhöffer and what happened to him at the hands of the Nazis. And all of us need to take note of that, and of Bonhöffer’s words and actions. We are all in this together, and for better or worse we need to learn that we are ALL human beings loved by God and put on earth for the good of all and for all of creation! Thank you for identifying the source of the quote. Heard it once before; did not from whence it came. Most of all thank you for your powerful response. What a wonderful reflection! Thank you so much for sharing. This was hard for me. I voted for both in their earlier rounds. Thank you St. Celia for your awesome words. I think you and Mr. Kober nailed what was important about Dietrich. But the vision of the 2 Sts. Is not different. No ‘Us vs Them’ mentality and ‘building bridges between the Church and the community’. Wonderful reflection. I love the quote from the card too. Bonhoeffer is worthy of the Golden Halo. Promulgating the discredited “Gospel of Barnabas” is odd and very naive. The Qur’an states Jesus alone is the Messiah (eleven times). Why would I ( or anyone) legitimize a forged document that says he is not? Thank you for expressing just what I was thinking, St. Celia. I’m hoping Bonhoeffer goes all the way to the golden halo this year. For the first time the “Madness” in the title of this exercise strikes me…it’s madness what Jesus did; it’s madness what Bonhoeffer did; we are called to this same marvellous madness for Christ and the world. Thank you. I voted for Barnabas because he gives himself to the community and believes in sharing. I’m with you,Oliver, but I think we will not be winners. Dietrich has much to offer, too. I would have liked it if Barnabas never came up against Bonhoeffer, so that I wouldn’t have to vote against him. Barnabas was pretty amazing, too. I really enjoy your comments, oliver eight years old. I like the way you think Oliver, eight years old, even when I don’t vote with you. Oliver, you are a thoughtful young man. I too voted for Barnabas, but it looks like the voting is trending towards the Bonhoeffer. I look forward each morning to reading the reasons for your voting choices. I’m with you, too, Oliver. Barnabas has always been one of my favorite Bible characters because I’ve so often needed the encouragement of others to get through life’s hard times. Realizing how much others needed encouragement, too, has made me try harder to be more like Barnabas in my Christian living. So Dietrich Bonhoeffer may win this round, but Barnabas will continue to be one of my Christian heroes. I voted with Oliver: for Barnabas, a sharer of things. Also I’m intrigued by this Gospel of Barnabas which has an inclusive Jesus as given to us by Barnabas the Bridge Builder. Oliver, you are a very wise young man. I love reading your comments. PS I voted for Barnabas also, his generosity is a great example for all of us, we all have too much stuff, I am trying to give away 40 things this Lenten season. Me, too, Oliver. We need to share. If we would do that the world would be a beautiful place and no one would be hungry or homeless. Bonhoffer got my vote today, as I found many of those quotes meaningful to my life and spiritual practice. How easy it is to be “my own Lord”, and how difficult it can be to serve. But, the rewards for which to be thankful are so plentiful! Let’s hear it for the chocolate eggs! What beautiful reflections to carry into this day and this week, from the saints and the bloggers and the good mad folk sharing this devotion. No contest for me. Bonhoeffer’s “Life Together” continues to influence me deeply. Thank you for what you wrote, St. Cecelia-very moving. My favorite Bonhoeffer story is during the war he would be invited to speak in Switzerland. He told the Nazis that he needed acolytes to serve at the different services. He always complained, when he returned, that they would run off in Switzerland. Truth he was smuggling Jews out of Germany. I, too, love that story. Me too. That’s one of the reasons I voted for Bonhoeffer. Another was the poem “Who am I?” Thank you, Jack. In today’s world, we need to reach out to our Muslim brothers. We need to build bridges to others as Barnabas does in his medieval Gospel. The “Gospel of Barnabas” has been deemed a forgery by most scholars. Asserting Jesus as the “Isa” of Islam and elevating Muhammad to be the ultimate messenger of God is by no means building bridges. Voted for Barnabas as the earlier saint and the underdog, but will be very happy to see Bonhoeffer move on. I too loved the “being my own Lord” quote; the unvarnished truth is always worth hearing again…. St. Celia said it for me and Bonhoeffers’s words said it for me, so I am voting for Dietrich this time. Sorry I had to choose. I was Bonhoeffer all the way until I got to the last paragraph about Barnabas. That changed it all for me. It changed it for me too. Although I was leaning towards Barnabas and then read about Bonhoeffer and thought I would vote for him. But then I re-read the last paragraph and voted for Barnabas. I lived on Cyprus for 5 years and visited Barnabas’ tomb (a bit creepy) so I read up on him. He strikes me as the kind of saint who could get along with most anyone, very much needed today! Thank you to David Creech for a wonderful write-up of Barnabas. Bridge builders are indeed needed today. Thank you St. Cecelia. Your words tipped the scales for me this morning and so Bonhoeffer. Barnabas to me. I’d feel bad about not voting for Bonhoeffer, except he’s probably gonna win anyhow. Thank God there were no Barney references to make it so I couldn’t vote for him! “The Church is the Church only when it exists for others…not dominating, but helping and serving.” Bonhoeffer is a saint whose words continue to speak to our day and age. His voice needs to be heard this Lent and beyond. I’m with Bonhoeffer all the way. I have a worn out copy of “Life Together” on my bookshelf. Bonhoeffer gets my vote today. Costly grace vs cheap grace. To repeat what Eric has just quoted “The church is only the church when it is there for others…It must participate in the worldly affairs of the human social order, not ruling but helping and serving.” How much we need those words today. I’m with Bonhoeffer for the golden halo. During the Civil Rights struggles Barnabas gave me the faith to be non-violent ; Bonhoeffer gave me the courage to continue the fight. Without Barnabas and his early witness and travels with, and even before, Paul, there might be no Bonhoeffer. Let’s not leave behind the voices of those first followers of The Way. (and thank you, Bonhoeffer, as well, for your witness, more important these days than ever). That said, I vote for the underdog, Barnabas. My thoughts, and my vote, exactly. Bonhoeffer’s spirit has lived in my soul and guided my life for fifty years. It s heartening amidst the chaos of our present world, to know that so many of you also, find him worthy of sainthood. St. Dietrich’s Feast Day, February 4. His LETTERS and PAPERS from PRISON remain as deeply moving as when I read them in 1965. And as relevant. It was suggested that I read DB’s book while a religion major @ Kenyon. I couldn’t. Too mauch family history. I could’t see Shindler’s List either. Now, with the election campaign in full swing, I feel we have come full circle to 1944. And, hung on a wire? the nazi’s saved their best for him. Overwhelming sometimes. Having been a small child during WWII, and young child reading Life magazine after the war,seeing the pictures of displaced persons and concentration camps, I’m finding some of today’s problems all too familiar. We desperately need the example and spirit of Dietrich Bonhoeffer. He gets my vote. Let us be the loving, serving church of Christ. The information about Barnabas, though it certainly speaks to us in our time, is way posthumous and of uncertain provenance. Bonhoefer is a hero of our own time, whose life we know clearly and can celebrate earnestly and deeply in our own lives. My vote goes to Bonhoefer. St. Celia, Thank you for your offerings. How we need Bonhoeffer’s spirit with us today. I love that Barnabas was a bridge builder, and spoke up for those who being denagrated. And I love that Bonhoeffer noted that the church is only the church when it is serving others. We so need both voices today. But what pulls me toward Bonhoeffer is his spirit of service even while being imprisoned by the Nazis, knowing a terrible end awaited him, he did not weaken in faith. What an example! A hard choice, as we must be thankful for those early saints who spread our faith, keeping it alive through the early years, yet also grateful for those who came later to keep the faith going through dark times. Ah, Lent Madness…you make me think! Good for you! I’ve always loved these words from Bonhoeffer regarding separation…from Letters and Papers from Prison..
I’ve always loved this quote, too! It’s a helpful piece of theology when you’re grieving, I think. At least it was for me. Will always vote for the actual saint over a work of fiction. Very moving reading this morning! Difficult choice, but I went with Bonhoeffer. Bonhoeffer gets my vote. St Celia, your Easter card gets the vote for the best in that regard. Bonhoefer has long been a hero of mine, and a lovely write-up by Beth Lewis clinches my vote. I particularly like what he says about our duties to each other: “The first service that one owes to others in the fellowship consists of listening to them.” I have to admit Barnabas also seems to understand our obligations to the stranger, and I am struck by his willingness to respect people of other faiths (something still lacking in many “Christians” even today). But I cannot desert Dietrich! I was going to vote for Bonhoeffer until I read the last paragraph on Barnabas. While The Cost of Discipleship has been my Lenten reading this year, I’ve been in an interfaith discussion group that meets once a month for over twenty-seven years, currently driving 140 miles round trip to attend so Barnabas got my vote. I find it hard , with some exceptions, to vote for saints of old when they are competing with modern days saints. Often the write ups include comments that we think are made up or just impossible. I remember the write up for one saint who was capable of being in two places at the same time. I believe the word used was “bi location.” The gospel of Barnabus and other of his writings (or those attributed to Barnabus) never made it into the Bible and so one has to wonder if the church fathers dismissed them because they were considered fanciful. My original bracket had Dietrich for this vote. But I have changed my vote to Barnabas simply because sometimes, it seems to me, the quiet, little known, seldom remembered saint deserves a little acknowledgment and appreciation. I probably won’t meet any “Bonhoefers” today, but chances are good I might come across a few “Barnabases”. Maybe this will help me pay better attention. That’s a very good way of putting it. I voted for Banabas, too, because bridge building and encouragement are my ministry. And I figured I might as well vote for the underdog. The ancient saints don’t fare well against the more modern ones. probably because there are such unbelievable stories about them — such as one walked for 6 miles preaching carrying his head after it was cut off, one survived drawing and quartering or my personal favorite — Thecla and her ravening seals and so on. Some of the unbelievable stories are my favorites! And isn’t there “unbelievable” stuff in the Bible? You mean like the day the earth stood still till the Hebrews won the battle? Not believable and not possible literally. Just because it’s “in the Bible” does’t mean that it’s factual. That’s what separates us Episcopalians from the fundamentalists ( among other things). Wow, what a response! It is not fair to have to chose on this one. Both begin with B? Who said the “day the earth stood still” in ref to literal interpretations, etc. “Gort, Klatu barqada nicto!” Oh, yeah! Klatu, barata nichto! Absolutely! One of the all time best! This is more fun than writing to on line dating sites! Oh, do you do that? All I’ve found are real losers who were no fun at all. Barnabas, the bridge-builder. How we need this now more than ever. Even with the rise of a certain new political figure and his striking resemblance to repeat the history that Bonhoeffer lived, I think Barnabas’ message of seeing the good in others and especially listening is a message that is more pertinent to healing the torn apart society that we are generating today. Barnabas because Bonhoeffer annoys me. And because he’s such a superstar that Barnabas hasn’t a chance. Went to a funeral at St Barnabas Irvington NY for a great service for a wonderful humble lady who did much for otheres and for her “whole church”. It was an hoor to be on home ground. But I had to vote for DB because we live in such danger now. During his time at Union, described by him as being a “sterile environment”, a black fellow seminarian invited him to attend a service at Harlem’s Abyssinian Baptist Church. Bonhoeffer described it as opening his eyes, ears, and heart to the essence of Christianity. His return to Germany to fight Hitler and the evils of Nazism would signal his last act of love by sacrificing his life. If he wins today, so be it; if he wins the Golden Halo, so be it. If not, so be it as he won the Golden Halo when he gave his life some 70 odd years ago. Thanks Bloggers for good blogging today. Two of my favorite Bonhoeffer quotes not mentioned in Beth Lewis’ excellent write-up: “God is the Beyond in the midst of our life.” And below, his poem “Who am I?” written in prison. wow. my words are , ummm, inadequate. Thank you, Jack, for the gift of these two quotes. Bonhoeffer, a saint for our time & all times. I predict that he’ll win the Golden Halo. I hope so, anyway. Barnabas gets my vote. I believe in building bridges not walls which is what Barnabas did. Bonhoeffer has a lot to offer but today it is Barnabas even though I know he will be ousted in this round. This is the most difficult choice since John vs Charles Wesley. I voted for the encourager. His example has been a light to my path. Both write-ups today were wonderful. In these contentious times I had to vote for Barnabas, whose legacy as a bridge builder has lived through the ages. I’ll be happy too when Bonhoeffer wins today. Dietrich Bonhoeffer 1906 – 1945 killed in a Nazi Conzentration Camp. I dug the entire six-verse German poem up. It seems to have been Written for New Year’s Day, with God promising in the first verse to be with us in the new year. Hymn 695 consists of Verse 6, a sort of reprise of Verse 1 without the New Year’s reference, followed by Verses 1-4. Oops, seven verses, and Hymn 695 is Verses 7, 2, 3, and 4. Silly me. I know just enough German to appreciate what an incredibly beautiful poem that is. I’ll add that to Rilke’s _Marienleben_ among the greats of modern German religious poetry. Thank you. I loved reading Rilke in college but never encountered the Marienleben. I’m going to get Hindemith’s setting from iTunes, if I can, and make its acquaintance. Thanks for the tip. “Who am I?”Bonhoeffer asked. A question I ask myself daily. Unfortunately, we know little of who Barnabas really was… only who a few others say that he was. And, sadly, we do know what happened within the church that spent the next thousand+ years convincing poor people they had to give everything they had to it. 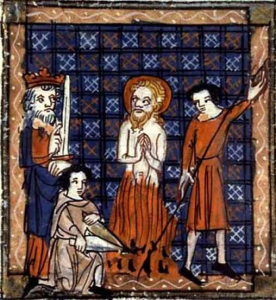 Not that that was Barnabas’s fault… but juxtaposing the images of a wealthy church vs. a hanging, naked man stripped of everything including his dignity… hard to shake. For mercy for them sinning,sick or dead. All men do so in faith or unbelief. Body and spirit feeds he with his bread. For every man, he as a man hangs dead. it helps me to remember that in Germany, the mainline churches chose the road of compliance with the powers of the day rather than the road of the Dissenting church, Bonhoeffer’s costly choice. Thank you for this, Johanne — another of DB’s poems from “Letters and Papers” that I had forgotten. Very apt with Holy Week approaching. Barnabas, whose story is a creation of Christians in many ages, showing their response to difficult times when the other and the outsider were difficult to see properly in the light of the Gospel. What a difficult decision. Having served at St Barnabas Church, I have to keep faith with the Son of Encouragement, in grateful thanks for all those who have and continue to encourage me. Bonhoeffer is a giant and I expect him to go on to the next round, but I am thankful for all who quietly and faithfully build bridges of understanding and reconciliation with little reward. Thank you for these expanded biography stories. Fascinating lives. I am voting for Bonhoeffer so more people will here his story. Think I voted twice by mistake, my apology. Once for Bonhoeffer. Again, it’s easy (for me) to see why Teddy (Anglicization of Dietrich) is winning in a landslide. Beth Lewis has picked a powerful selection of quotes to show what a beautiful spirit Teddy was. The most that can be said for Barnabas, on the other hand, is that lots of people liked to write in his name for up to 15 centuries (post-Medieval) after he died–assuming he ever lived. I stumbled on a bio of Bonhoeffer in the bargain pile at the college bookstore when I was 18 or so. I had never heard of him, or that anyone like him used his Christian faith to fight the Nazis. I was overwhelmed and have always considered him one of God’s finest gifts to humanity. I voted for Bonhoeffer this time, both Bs last time. Excellent comments from everyone – almost the best part of Lent Madness! Now I really want to know – who prevailed in Friday’s round?! Lady Julian put the dogs out, woof woof woof woof. Clicking on the Bracket tab allows you to look up results to date. And I’m with you–the comments are rich complements to the blogs and videos. This great B and B matchup today illustrates the fabric of Christian faith . Barnabus is part of the warp —the first threads put on the loom—; Bonhoeffer is part of the weft —the threads that interlace the warp. Thus, fabric is created. The relationship of warp and weft can be simple, like plain weave, or complex, like overshot or double weave or a gillion other patterns. Lent Madness offers daily, saintly, weave structures for us to analyse. I’m voting for Barnabus, part of a complex warp, while reading Metaxas biography of Bonhoeffer, part of an amazing weft. Wow. My wife is a weaver. She would appreciate your analogy. I’m gonna show her what you wrote. What a wonderful picture of the “old” and “new” relationships. I believe it will change the way I see and think about some of the questionable stories —Thecla for one. Thank you for my Lenten gift. In terms of Bonhoffer’s life story, I voted for the Bonhoeffer who heroically opposed the Nazis rather than the Bonhoeffer who (if he lived in our own day) would have caused headaches for denominational ministry ethics committees by becoming engaged to a teenager who was once in his pastoral care. 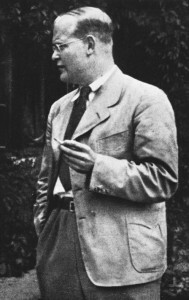 In terms of Bonhoeffer’s theological work, I voted for the “catholic” Bonhoeffer of “Life “Together” rather than the young, zealous ultraconservative of “The Cost of Discipleship” or the minimalist “progressive” of the “Letters and Papers from Prison”. But, as I’ve said before, there’s a Bonhoeffer for almost everybody. I voted for Barnabas this time, for his sharing and because I wanted to acknowledge his goodness in spite of my expectation that he would not win enough votes to get into the very finals. I had to vote for only one, so I chose Barnabas. I pretty much never pass up the chance to vote for a saint who appears on the pages of Scripture. Bonhoeffer very nearly caused me to break my own rule, so I’m pleased to see he will be moving on to the next round. Despite the fact that I like Bonhoeffer, as usual my heart goes to the older Saint (the one from medieval or classical times). Also he trusted Paul when lots of people didn’t ang that’s got to count for something. Here we are in soggy, cold New York City surrounded by beautiful spirits and elegant churches. Last night, on the cab ride, we drove past Union Theological Seminary where Bonhoeffer studied. He could have stayed here in NY or in London where he worked, and been safe, but he chose to return to Germany. He’s got my vote. Today was difficult-I wanted to vote for both. I liked GiinnI will be happy with the winner either way. I finally voted for Barnabas because he has had a longer time for people to know him. I liked Fiona’s comment: “I am thankful for all who quietly and faithfully build bridges of understanding and reconciliation with little reward.” I also liked the analogy Ginny about weaving. I love the quotes from Bonhoeffer, and am happy to see him moving on. I voted for Barnabas because the last line of the write-up, about the desperate need today for bridge-builders, resonates as I head off to help democracy happen in Florida on this primary Election Day.